I get the "cartridge not recognized" error for all 4 colors on refillable cartridges on my Epson WF-2530. I bought a WIC firmware downgrade key and successfully downgraded from LD05DC to LD11CC. The error remains the same. I have tried EVERYTHING on the web to remedy this: power down, reinsert the old Epson cartridges, reinsert the new refillable cartridges one at a time, all at once, turn off Epson Status Monitor, all to no avail. Is there any way to make the 2530 chipless?? Can I get a refund if there is no solution? I'm hoping there is a solution. My cartridges and ink are from cube1113, they seem like good quality. I liked this printer just fine until it stopped recognizing aftermarket cartridges. 3. For chipless version this model is not supported yet. 4. The solution for your printer is to install proper chips or check CISS board in the printer. No, I did not upgrade. 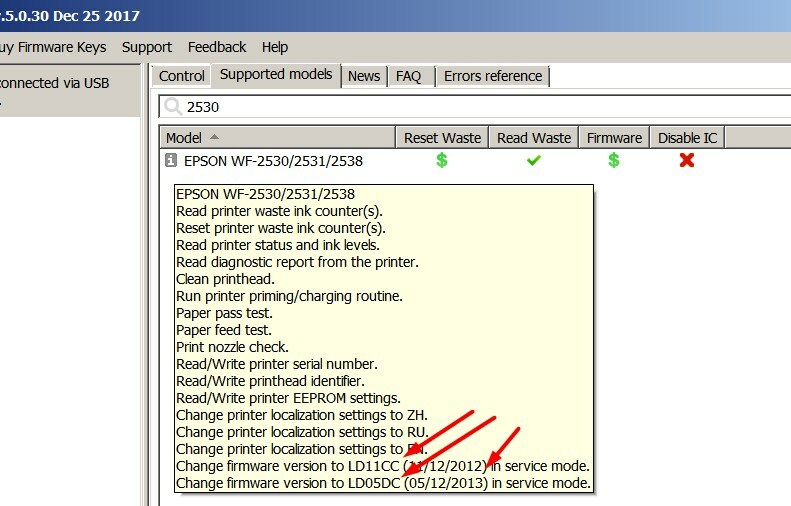 You can always upgrade for free from Epson's site. I paid to downgrade, in hopes that an earlier firmware would let me use 3rd party cartridges. I started with: firmware version LD05DC (05/12/2013). I bought your software to downgrade to: LD11CC (11/12/2012) in service mode. So I did a downgrade. Except the printer still won't accept 3rd party cartridges as it has previously. Since you don't offer an earlier firmware, and I can't find one, that's the end of the road. Hence my next question - can I get my $20 back, since the firmware downgrade didn't work? I'm happy to pay for a chipless solution for WF-2530. I'd rather use this printer than buy a new one that accepts refillables. For 2530 chipless firmware is not available yet. WHY You decided to make firmware downgrade???? You have just hardware problem - chips on ink cartridges are broken or dirty, CIS PC Board is broken, electrical cables in printer must be checked - so You have to check all INK CHIPS related items. Firmware is good. Just to add on, any ETA for chipless firmware for 2531? Am facing the same problem with the user, downgraded the firmware too but to no avail. Am deciding between sticking with original replacements, or getting a new 2651 printer (which can be flashed with chipless firmware).